This past weekend, I had the excellent fortune to attend NYPL’s Crafternoon! 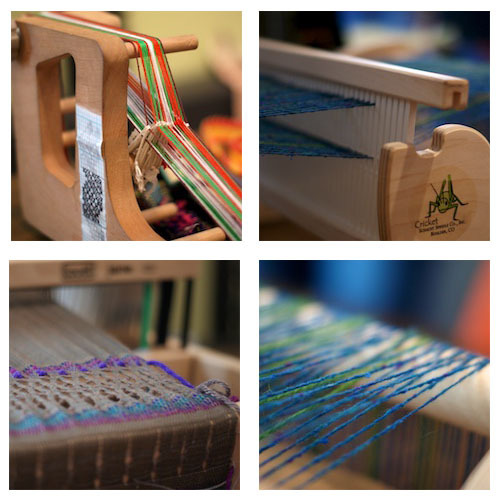 The topic – hand weaving – was just one of the latest in a number of serendipitous events that seem to be pointing me in the direction of my loom, but the truth is I have been hankering to attend a Crafternoon for the last couple of years. Somehow the timing never worked out – until now. Handmade Crafternoons are the result of the combined genius of Maura Madden, a writer and performer who started crafting parties with her friends over a decade ago and eventually wrote a book about it , and Jessica Pigza, a crafty rare-book librarian at NYPL, who was looking to expand the programming at the library. I have admired Jessica since she partnered with Design*Sponge back in 2008 to create Design by the Book, a series of online episodes inviting various local artists to use NYPL’s vast collection of primary source material to inspire their own work. Each episode is beautifully produced and highlights the relevance of the Library’s collection to the creative process. 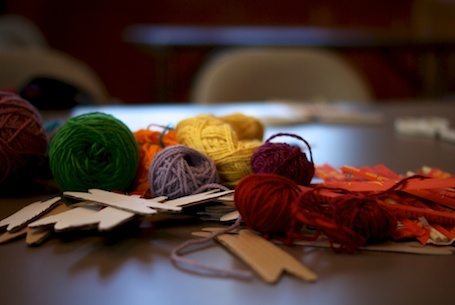 Started in 2009, the NYPL Crafternoons bring the same idea to the crafting public by inviting people to participate in projects like lace-making, zine-making, stitching felt, and book arts. Each event includes a special guest (usually an artist or “celebrity crafter” – past guests have included Ayun Halliday and Debbie Stoller, some personal favorites), a hands-on project, and a display of related resources from the Library’s collection. Awesome, right? So on Saturday afternoon, I made my way down to 42nd street with great anticipation. I knew that the special guests were going to be members of the New York Guild of Handweavers and I was expecting the event to be a demonstration of how floor looms work. With upwards of 50 guests, I wasn’t sure how a hands-on portion would be possible. 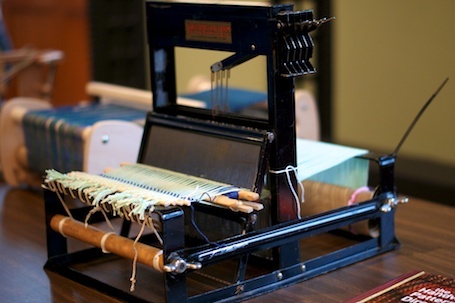 When I arrived, there were several beautiful table looms on display, along with an array of fabric samples and weaving books. My favorite was this lovely little table loom, the Structo Artcraft. First manufactured as a toy, I hear it is still in use at FIT to teach basic fiber classes (but that is – as of press time – still unconfirmed). When I was done nerding out on all of the table loom models, pattern books and cloth samples, I was delighted to see tables set up with yarn and other crafting supplies, too! 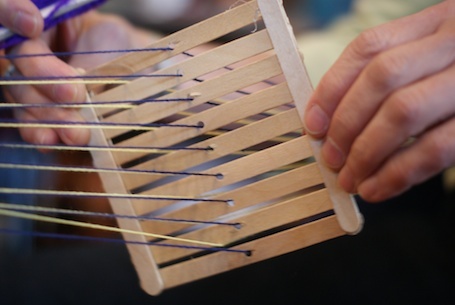 And at each seat was a tiny DIY loom made of popsicle sticks, already warped and ready for use – 50 in all! The session started with a welcome by Jessica and Maura and an introduction of New York Guild of Handweavers present – a group of people from all walks of life, brought together by their love of the fiber arts, as evidenced by the amazing handwoven scarves most were wearing. The guild is the oldest in the United States, started in 1941 by Berta Frey, an occupational therapist who wrote many books on weaving. They meet once a month during the academic year and welcome new members and novice weavers. 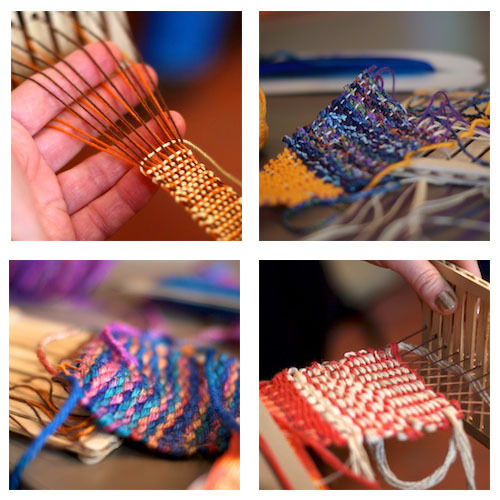 According to one member I spoke to, when approached with the idea of participating in a Crafternoon, the challenge was to figure out how to get people weaving themselves, rather than just holding a demonstration. The answer was in the rigid-heddle backstrap loom made out of…. popsicle sticks! 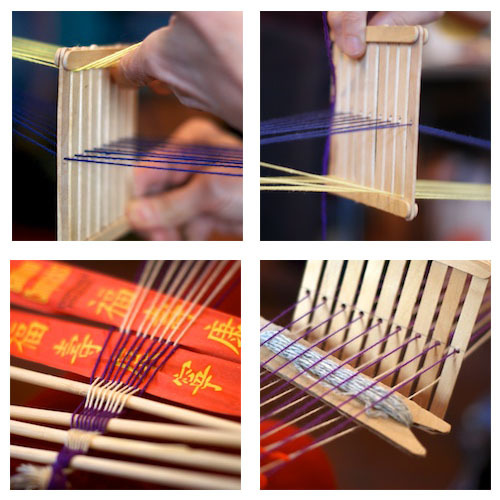 Members spent several hours constructing and warping the ingenious looms we were using, which functioned as a perfect introduction to the basic concepts of the craft. If you are so inspired to make one yourself, the instructions are here. After the introduction, the guild members fanned out to each table to demonstrate the use of our miniature backstrap looms. With one end of the warp threads tied to the table and threaded through the sticks – one color in the holes and the other in the spaces between the sticks – the other end of the warp threads were tied to my belt loop (for those sans belt loops, they had a rope you could use to tie on to your waist). 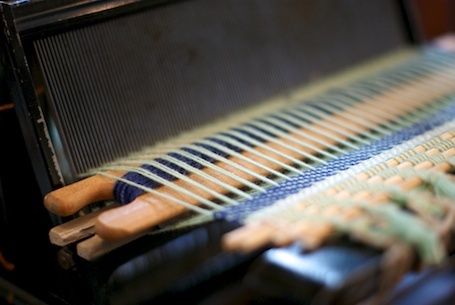 The spaces between the warp threads could be made by lifting up or pushing down the sticks – which acted as both heddle and shaft. The first step was to spread out the warp threads tied to my waist and to do this we used two sets of chopsticks and their wrappers. I loved the DIY and recycling aspect of this project. One could literally make all the elements of this loom out of crap you know you have in your apartment. Even the shuttles – used to hold the weft thread – were made out of discarded cardboard. It took about five minutes to get up and running and was the perfect way to learn the basic tenets of how cloth is made. And this is what I love about weaving and fibers. We are all working with the most basic of tools and creating such a wide variety of patterns and designs. 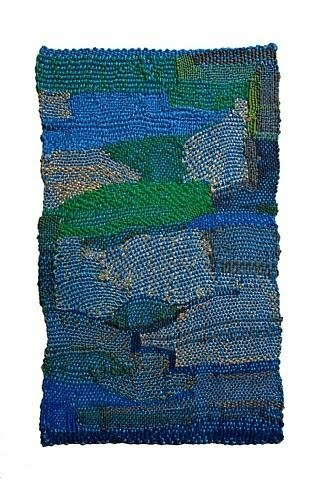 From here, the next step up is a basic lap loom, the kind that one of my very favorite artists, Sheila Hicks, used in the 1960’s to create a large series of small weavings that read more like paintings. From there, you can move on to two, four, or eight-harness floor looms and the possibilities are endless! By the end of the afternoon, I was already planning my next project and committed to using the yarn I have at home to do it. 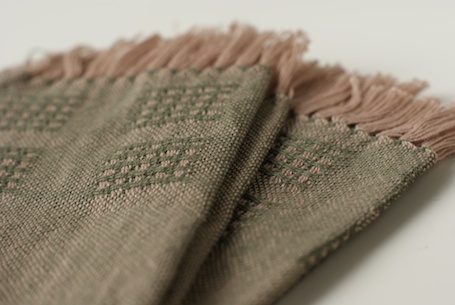 As a lovely end-note to the event, I even won a raffle prize of two exquisite loom-woven napkins – something to aspire to when I join the Guild. At $40/year, why wouldn’t you join such a cool organization? Plus, I’ve always wanted to be a member of a guild. So the Crafternoon delivered! There is something wonderful about going to the library to make something and it has inspired me to think about how I can promote the use of my own library collection in new and hands-on ways. And it was fabulous to meet Maura and Jessica, whom I had long admired through the blogosphere. I can hardly wait for the next on on April 14th, featuring artist Noah Scalin on kickstarting your creativity through making something every day. Sign me up. Wanna join me? This entry was posted on March 7, 2012, 7:09 am and is filed under inspiration, make. You can follow any responses to this entry through RSS 2.0. You can leave a response, or trackback from your own site. Awesome blog! I may join you on the 14th. That would be lovely! You have to rsvp to make a reservation because they fill up. Click on the NYPL link and the directions are there. Looking forward to seeing you! That sounds like a wonderful thing to do in preparation for a great weekend. Fantastic post! Thanks so much for coming – hope you’ll be a regular at Handmade Crafternoons! Me, too! You’ve got a great thing going there!